I recently bought this new book about Architectural Technology written by Stephen Emmitt. It is currently in it's second edition and it has been released in 2012 (first edition was released in 2002). What makes this book great is that it's supported and promoted from the Chartered Institute of Architectural Technologists (CIAT), which I think that whatever you are going to read in this book is not just an opinion of Stephen Emmitt but they are also facts that will enhance your knowledge on what Architectural Technology is. In the book says that 'This core textbook on translating creative designs into functional buildings is written for undergraduates in architectural technology, architectural engineering, architecture and building surveying'. The author also highlights in the introduction: 'The book is not designed to give answers but to highlight some of the challenges and opportunities that make architectural technology such an interesting and engaging subject'. And in fact, this book is not a guide to teach you how to be a technician or how to design, but will help you understand what is Architectural Technology in a greater depth. 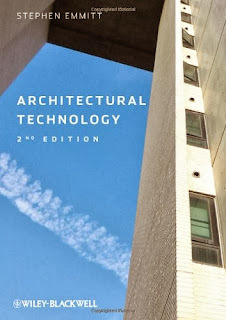 I highly recommend this book to be part of your collection, especially for students, as we are the ones who need to understand the meaning of Architectural Technology in a greater depth in order to be part of it, and this book is one step to that point.